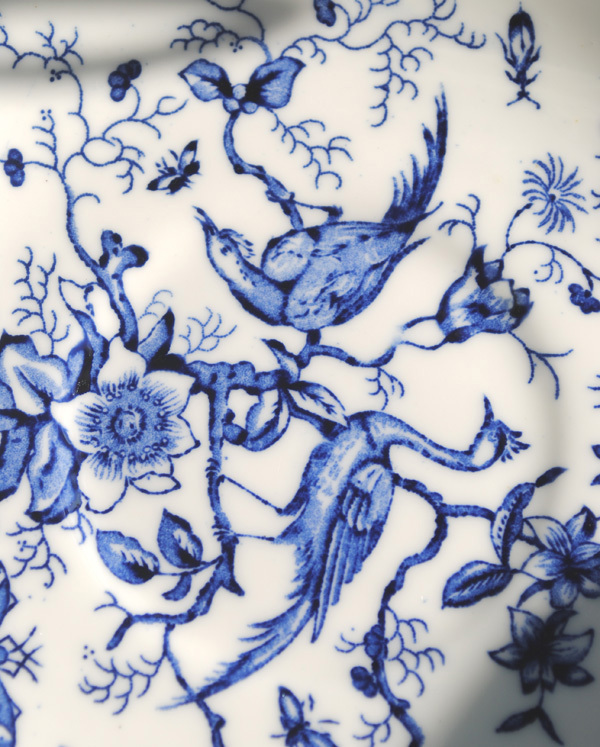 Today I am sharing about one of my favorite make of china....Coalport. This vibrant floral cup is a beautiful example of Coalports quality. Easter Basket Tea Cup swap! Wonderful design, love the mix of ruffled edges and plain! This is a truly dainty and feminine set. Perfect for afternoon tea in the garden. I adore the handle and the scalloped footing. And this incredible art work in stunning blue! Coalport cups feel so good in the hand and this one is light as a feather. Here is the backstamp for the blue and white cup. This portion of a page from Geoffrey A. Godden's book Encyclopedia of British Pottery and Porcelain Marks indicates this cup was manufactured after 1920 but before 1939. 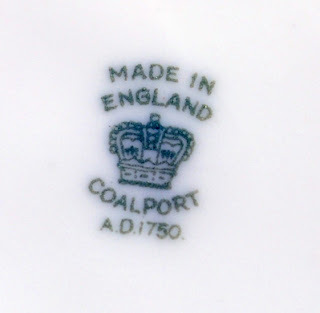 1796-1815 Pottery from Coalport's was not marked, but from 1805-1810 they began to use the simple backstamp of "Coalbrookdale" alone, these were very rare. 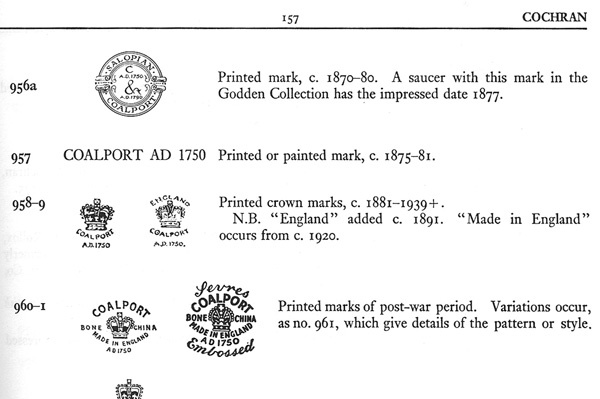 From then on Coalport's backstamps went from simple letters, to very fancy designs. They even had some that were imitations of Meissen! If you would like to play along, just create a post with a tea cup in it you would like to share, then come back here and sign up with Linky tools below. I am truly enjoying visiting you all and seeing your tea cups, and hearing about your life. They are BEAUTIFUL Terri! I especially LOVE the second one with the birds. I have NEVER seen anything like that one. Don't you just LOVE finding info and reading about the factories that made our wonderful china? Thank you for sharing and Co-hosting all our fun every week. 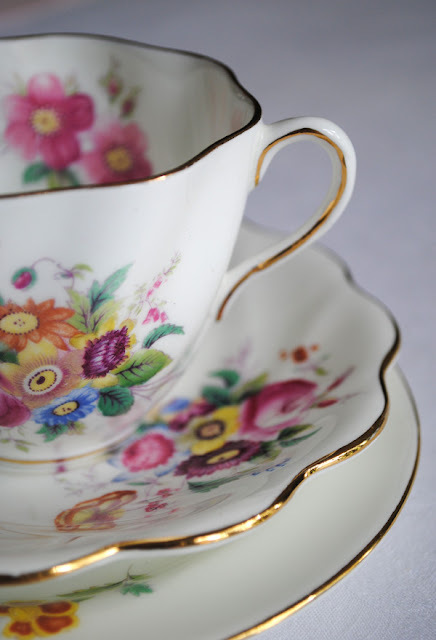 You share two gorgeous Coalport cups this week! You were lucky to be offered such beauties! 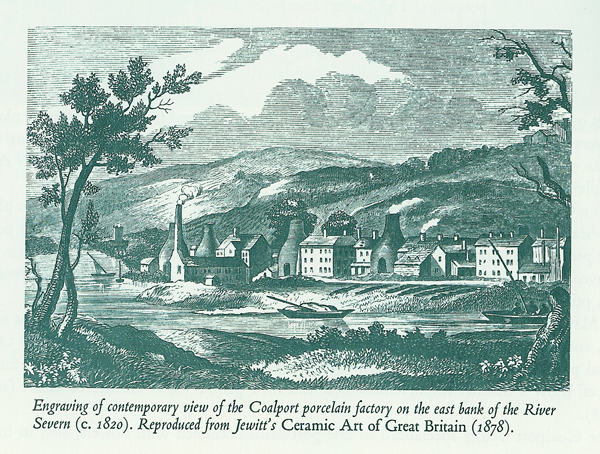 I loved seeing that old print and reading about Coalport, a special name in the history of English china manufacture that I also very much appreciate. Both teacups are gorgeous! 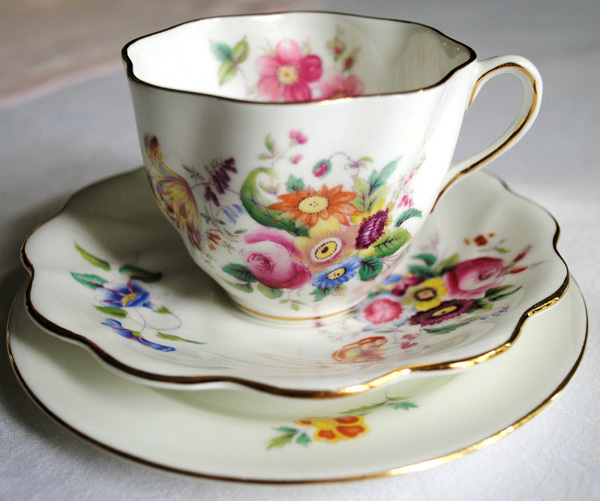 Thank you for sharing the information on Coalport teacups...I like learning the history. Hi Terri! I love both of your teacups. 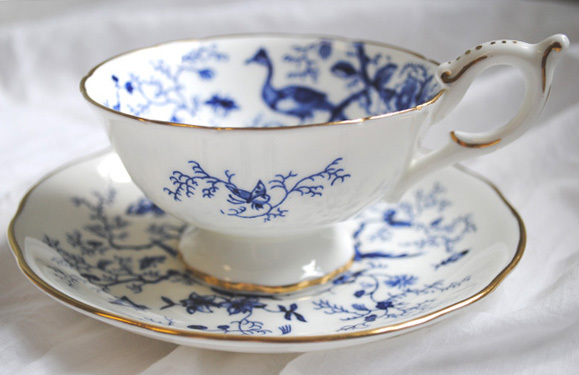 I don't have a Coalport teacup but now I will be on the lookout for one. I love your teacups, especially the blue one! I have had my eye on a red one exactly like it for quite some time but they are asking seventy dollars for it and I refuse to pay that. Lovely teacups you received as gifts. I always enjoy the history of them too. Hope you have a delightful day. I think both cups are outstanding. The first one has a bit of orange in it which looks striking among the other colours and the second one with its birds is just so pretty! I always love to read your description of the cups you show us. such beautiful teacups Terri- I really love the first one with its delicate painted flowers-gorgeous! very lovely teacups and the set! having been to the same pottery in Stoke I always appreciate seeing your mention :) and the historical details.. have a great TeaTime ! Hi Terri..more gorgeouness.your photography is pure awesomeness too...i love them both..the first is so cheerful and makes me happy!! and the second from your sis..how sweet..it is truly stunning..wonderful blues!! It is so special when you receive cups from loved ones isn't it!! Beautiful teacups as always Terri! I so admire your collections, photographic talents and knowledge of teacups!! 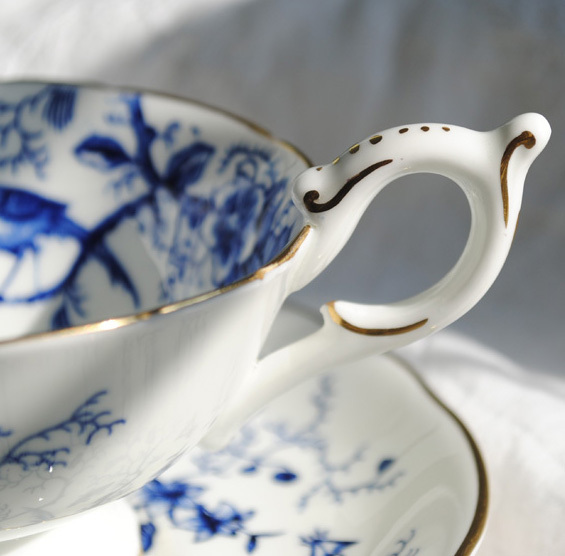 Enjoy a terrific teacup tuesday!! how sweet from Martha to chose this beautiful tea cup for the swap. I guess, she knows how to make you a special fun. Both cups are really beautiful and dainty. Thank you for sharing your treasures and the wonderful informations. ANd for hosting this sweet event. Hello Terri! I really love your teacups! They are very beautiful. I'm very happy joining your fantastic party. I'll visit other teacups. Hi Terri! I look so forward to your teatime posts each week! Your artistic eye and the quality of your photos and your educated understanding of all things teacup assure me of a blessed visit. You find the most beautiful pieces and I love how you present them - I want to find one of these teacup pottery books and educate myself! You inspire me regularly! For some reason the first cup reminds me of August. It's very pretty. The blue and white is just classic gorgeousness. You must have such a huge collection. It's really a great one! I adore the blue and the bird....sigh. You are so knowledgeable on the teacups, and your collection is amazing and gorgeous...it inspires me artistically! Thanks for sharing your information on your Coalport teacups. Your teacups are beautiful...so elegant! Have a wonderful week.